Emirates has expanded its popular free inflight Wi-Fi service with generous rates for all flyers. Effective immediately, all Emirates Skywards Platinum and Gold members can enjoy free unlimited Wi-Fi during their Emirates flight, regardless of their class of travel. This privilege also applies to all Emirates Skywards members travelling in First and Business class. In addition, Economy class customers and non-Skywards members can now enjoy 20MB of free data usage within the first 2 hours of log in, double the current 10MB free being offered. Additional data can be purchased in 150MB or 500MB blocks at attractive rates, with tiered discounts for Skywards Silver and Blue members. “Emirates has made significant investments in our inflight connectivity. Today, Wi-Fi services are available on over 200 of our aircraft, and it is a service that Emirates continues to subsidise heavily. Inflight Wi-Fi usage, already popular from the start, has grown tremendously. 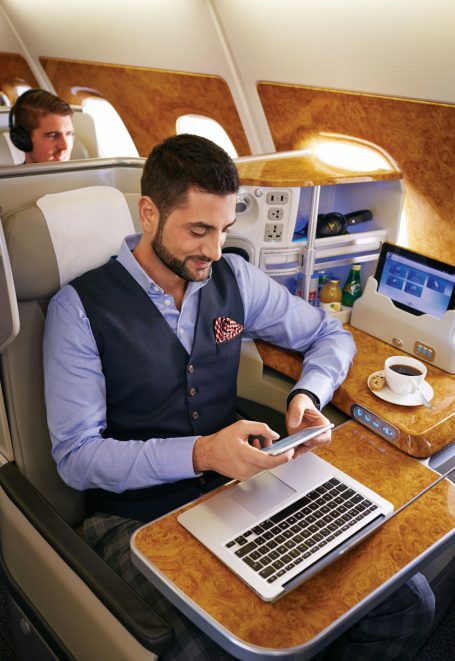 Our new inflight Wi-Fi plans reflect Emirates’ commitment to continue providing this as a free service for as many customers as possible, especially to our most frequent flyers,” said Adel Al Redha, Emirates Vice President and Chief Operations Officer. The doubling to 20MB of free data will suit customers who are light Wi-Fi users looking to send short messages to their families and friends, or check their social media accounts while flying. Business travellers or more heavy users of inflight Wi-Fi will have the flexibility to purchase additional data packages as needed.